The solution is simple to use horizontal scrolling with always mouse wheel, ina all Windows 10, 8.1, ie 11, and 7! From Version 3.81: Always Mouse Wheel does forward the horizontal scrolling windows message from the mouse wheel. 1.) ... Activate the horizontal scrolling with always mouse wheel! 2.) ... Use as a sound volume control when the mouse wheel on the taskbar! 3.) ... Disable Always-Mouse-Wheel in Metro mode! 1.) Activate the horizontal scrolling with always mouse wheel! While holding down the SHIFT key, horizontal scrolling with mouse wheel. Please use always ... the latest version of always mouse wheel on Windows! (Image-1) Horizontal scrolling with always mouse wheel, how to? 2.) Use as a sound volume control when the mouse wheel on the taskbar! Options ► "Use as volume control when the mouse wheel on the taskbar"
(Image-2) Sound volume control via mouse wheel! 3.) Disable Always-Mouse-Wheel in Metro mode! 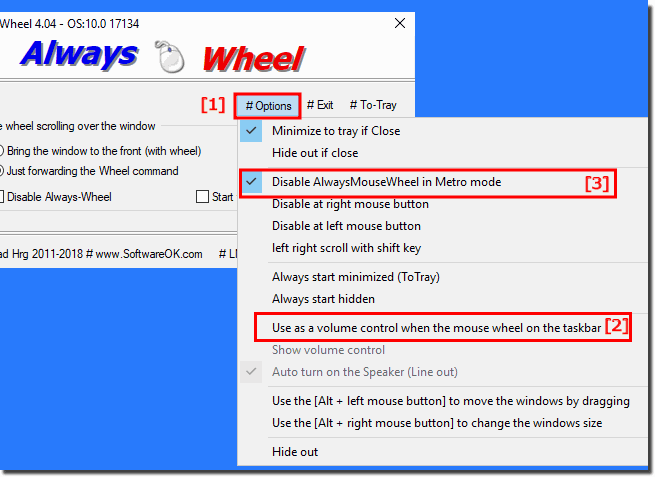 Options ► "Disable AlwaysMouseWheel in Metro mode"
(Image-3) Sound volume control via mouse wheel! AlwaysMouseWheel - FAQ-4: Horizontal scrolling with always mouse wheel, how to?